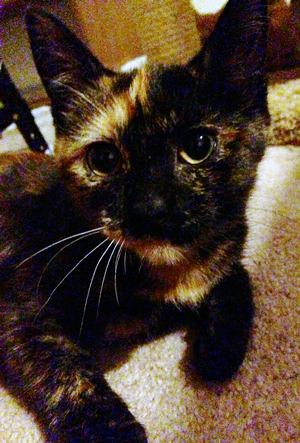 Tina is about 4-months-old, spayed, vaccinated, and litterbox trained. Photo credit: Community Cat Coalition. What I think is really important, and what I want people to focus on, is that I'm just as beautiful on the inside. I'm a go-with-the-flow kind of girl, who can play with the wildest of them but also lounge with the laziest. I'm interested in everything going on around me but never get in the way, and I show you how much I love attention without ever laying it on too thick. So, if you're interested in a best friend whose beauty on the inside shines through to the outside, I might just be your girl! Please email fortheloveofcush@gmail.com to find out! P.S. I'm about 4-months-old, spayed, vaccinated, and litterbox trained.